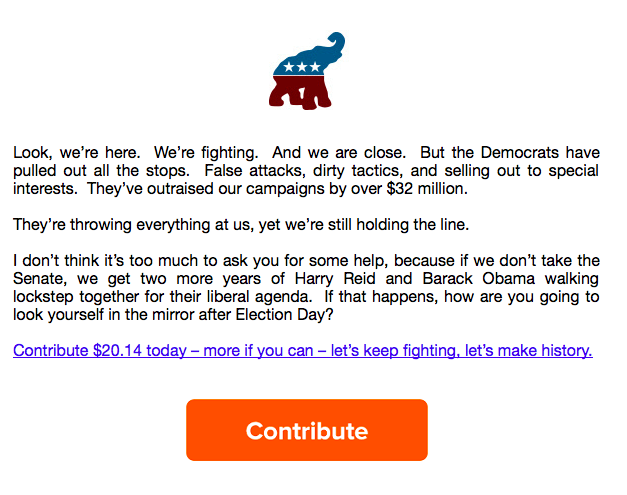 For reasons far beyond our ken, the hardworking staff has been peppered lately with emails from Republican hustlers looking to shake us down for campaign contributions. Sen. Marco Rubio (R-God’s Waiting Room) kicked off the right-wingding with the subject line Your membership, Friend. I know you are busy, so I’ll make this quick. President Obama, Harry Reid and Nancy Pelosi have outraised us by a whopping $27 MILLION already this cycle. We are now only 2 days away from our Mid-Month Fundraising deadline. Right now we are still short of our goal, and need 124 more conservatives to renew their NRCC membership to get where we need to be. Will you help us by renewing your conservative membership for 2014 by chipping in $25 today? The liberals are going all in to win back the House and keep their control of the Senate for the President’s final two years in office. We’ve already seen what his policies can do to America—imagine if he has a Democrat-controlled Congress at his side. That’s why we’ve set an ambitious goal of renewing memberships from around the nation, but we are still coming up short. Please don’t wait, Friend. We need you to renew your membership today. Contributions to the National Republican Congressional Committee are not tax deductible as charitable contributions for federal income tax purposes. Paid for by the National Republican Congressional Committee. Not to get technical about it but 1) we have very few friends, and 2) Marco Rubio is not one of them. Beyond that, we’re not a conservative – we’re an independent. But we do subscribe to The Weekly Standard, which we suspect might be the origin of this emailstrom. Next up: the National Republican Senatorial Committee. Subject line: How will you look yourself in the mirror? Actually, at our age we don’t look at ourself in the mirror all that much. It’s the poor man’s equivalent of having a portrait in the attic. Everyone agrees that President Obama’s leadership in his second term has been even worse than we expected. So I’m hoping you will join me by chipping in $45 today to help our conservative candidates in key races across the nation. We need more conservatives in Congress to stop his agenda in his final two years. Friend, I know from experience these next two weeks are the most critical for a nationwide campaign. That’s why Congressional Republicans are pushing for 259 new donations before midnight tomorrow. Month after month, the Democrats have posted record-breaking fundraising numbers. Your contribution will go immediately into helping with critical get out the vote efforts, phone banking, and securing TV ad airtime. Protecting our House majority is the key to preventing this Administration from fundamentally transforming our nation. If the Democrats win and Nancy Pelosi is back in the Speaker’s chair, the President would be able to push through his agenda with ease—cementing his liberal legacy forever. We can’t let that happen. Please join me by making a contribution right now. Again: 1) we have very few friends, and 2) Mitt Romney is not one of them. This entry was posted in Uncategorized and tagged Barack Obama, Harry Reid, Marco Rubio, Mitt Romney, Nancy Pelosi, National Republican Congressional Committee, National Republican Senatorial Committee, portrait in the attic, The Weekly Standard. Bookmark the permalink. 2 Responses to GOP = Got Our Pitch? How are you only on their “$45” list? You’re good for way more than that, to save us from the tyranny of clean water.